It was again time for another tournament. I used the time since the last ones (read about it one of them here) to work on my skill set, diminish my flaws as good as possible and to get in an overall good and better shape. That’s why I signed up for the gi and no-gi tournament No Way Out III, which took place on the 7th May 2016. This time the road trip to the tournament was cut in two parts, as my dear editor in chief and I, stopped at a friend’s place to stay for the night and take the time to catch up. You need to be resourceful with you time and make sure to spend time with your friend. Life cannot be all about BJJ, or maybe it can! Once we arrived at the No Way Out III hosting gym (No Fear Muay Thay). I finalized my registration, paid the fee and proceeded with the weigh in. It was an easy weight cut, as the weight bracket in which I participated ranged from 65kg to 75kg. I usually walk around at 70kg. As the tournament only started in the early afternoon, we enjoyed the sun and warmth out there and mingled. The people at the location were good fun and we spent quite some time exchanging fantastic stories. As a few teams were stuck in traffic, the schedule of the tournament was put upside town and the staff had to quickly re-organize the event. This happened in part on the fly, especially as the team coming from Switzerland had to cancel as they wouldn’t have made it in time anymore. Once that was done, the gym team head and the staff went through the rules. No surprises there, but always an important part in my opinion. I made it to the finals! The first fight is always the hardest, at least it is for me. You don’t know what to expect, your heart rate is not perfect, mainly due to nervousness and excitement. So winning the first one is important. It puts my mind and body into full fighting mode. The second fight was against the guy out of the higher weight division. We had a good roll, but ultimately he proved to be the better fighter that day. After some time scrambling his higher weight and strength were too much for me and he forced me into too many mistakes. Once he had an opportunity to choke me out, he went for it. I fought the choke as best and as long as I could, but had to tap in the end. It was a fun fight and I’m happy about my 2nd place. After my fights with gi, I changed into shorts and prepared for the no-gi fights. I was both relaxed and excited at the same time. Relaxed, as I had two good fights and was ready and prepared for more fights to come. Excited, because it was my first time competing at a no-gi event. I had a few no-gi training sessions, but ultimately I entered new waters. The first fight felt weird, I had no idea what to do. So I ended up mirroring my opponent. In the end I lost the fight by one point. Luckily the No Way Out III staff made sure that everyone had at least two fights. So there was more to come, much more. But I didn’t know that then. The next fight I lost by points. I was looking for the submissions but my opponent did a good job in protecting himself. The fact that this was already my 7th fight didn’t made it any easier. My stamina started to deteriorate and my arms and hands had not enough strength left to properly push through my opponents game. It was a fun day with plenty of experience. The people there were really nice and the organizers had a great catering for a more than decent price tag. To me the weekend as a whole was a great small weekend escape and I had refreshed not my body but definitely my mind with new things and some joy. The German martial arts magazine GNP1 wrote an article about the event too. Feel free to check it out. I also talked to the organizers and not only do they want to host another No Way Out this year, they want to ramp it up even further, maybe even live streaming the event! Let’s see, I’m certainly looking forward to it! 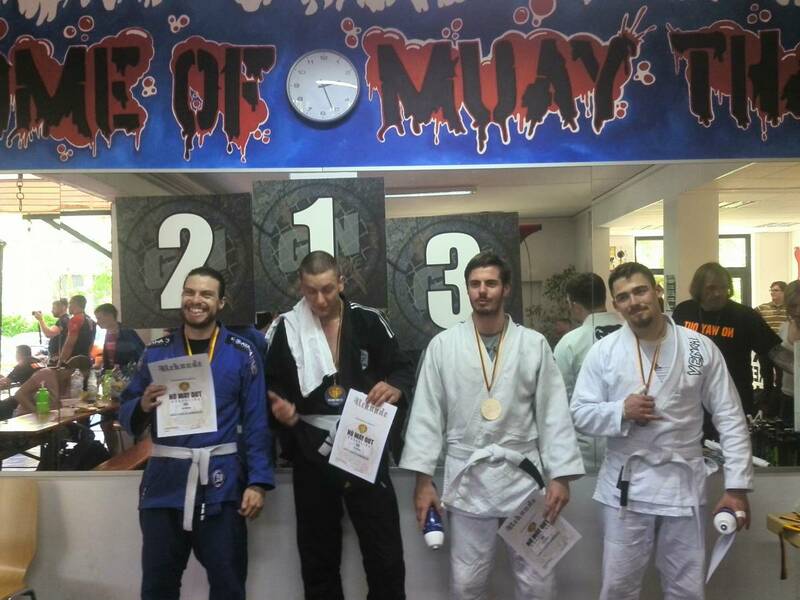 This entry was posted in BJJ, Lifestyle, Sport & Fitness, Travel and tagged BJJ, gi, jiu-jitsu, martial arts, no way out, no-gi, tournament by Stefan. Bookmark the permalink. Hat mir Freude gemacht mal ein paar Kämpfe von dir zu sehen. Habe Papa auch einen gezeigt Hoffe mal alles live zu sehen.